Looking back through my previous posts, I'm quite surprised to see that the books I read haven't really been mentioned. There is no Books/Reading/Library category (well, there will be one after I write this up) despite books, reading, and the library being the things I carry most often, the thing I do in my spare time, and one of my favourite places to just kill time in Wellington, respectively. Authors and their blogs do get mentioned here or there on occasion. 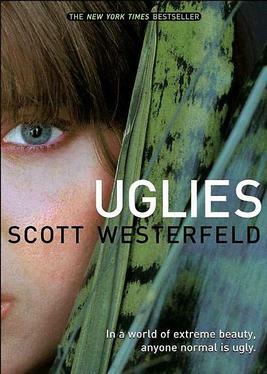 Today's mention will be Scott Westerfeld, a science fiction author whose more popular works actually live in the young adult (YA) section of the library: the Uglies "trilogy" (4 books, with a 5th as a sort of companion of the Uglies universe to be added), and the Midnighters trilogy. I actually came across Scott's work when it was just stuff in the vanilla-sci-fi section of the library (The Risen Empire, and sequel The Killing of Worlds). I've been meaning to read his Uglies trilogy for a while - I even had it down as something I might buy for myself last Christmas - but only got around to it now because the popularity of the series means the books are always on loan. Hmm, must be in one of those special displays or other sections that highlight good books, I thought, so I started going through the entire YA section of the library, searching for this one book. I eventually found it after referring to the library database once again; seeing that the book was just returned today, and finding it in the Recently Returned section of YA. But my discovery-of-the-day award would actually have to go to this new category of YA books that I came across. The kind of stuff you'd find in there? Gossip Girl.